– Create a folder by naming it as you like, example CCminer msvc 2015-Unzip the folder “CCminer. rar” and put the files in your folder previously created. – You now have a folder containing this: In this folder we can observe only one important thing: the mining software which is called “Ccminer. exe” We will have to create a. bat file in order to be able to execute the mining software ” Ccminer. exe “indicating information inside it. -Open your Windows note block indicate this inside: Ccminer. 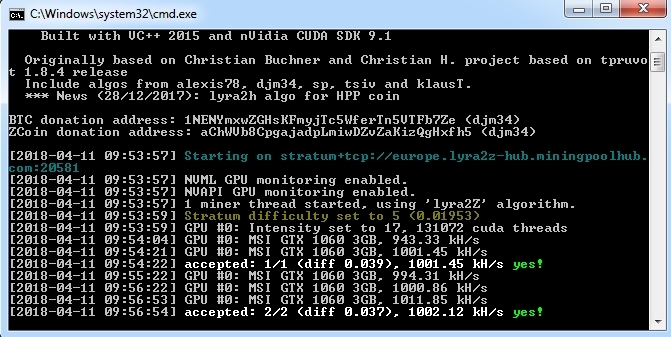 exe-a lyra2z-o stratum + tcp://europe.lyra2z-hub.miningpoolhub.com: 20581-u Cryptos-Mining. RIGHOME-P X-I 17 This is an example, so we start by telling our. bat file ( Your block note) to run our mining software ccminer. exe we tell him the algorithm to use-a lyra2z the address as well as the port of the mining pool-o stratum + tcp://europe.lyra2z-hub.miningpoolhub.com: 20581 Our wallet address which here will be Our username because MiningPoolHub works like the pool Suprnova-u cryptos-Mining. RIGHOME the password that will be all the time “X” except special case-P x the intensity of your graphics card, we observe that we indicated-I 17 for example being Given that the graphics card mine permanently on personal PC and that we do not want it to paddle during the creation of the site Cryptos-Mining or other tasks. The intensity will depend on your graphics card but “17” is really very low, it is up to you to mount this intensity until you find the right parameters by having a stable RIG. As soon as our file. Bat is ready IE our block note with the information inside we just have to “save it as” with a clear but simple name and then Add. bat at the end of this name: Obviously you need to replace the information below Above by yours. To find out about the mining pools, check out our dedicated article on this topic. To have a wallet address there are two possibilities: – The installation of the local wallet of the crypto-monnaie, it is a software to be installed on your computer that will synchronize the blockchain in real time and you can create the number of address you (Deposit address). – Retrieve the deposit address directly on your Exchange platform by checking correctly beforehand if your crypto-currency is on this exchange platform. Our article for “Where to find your crypto-currency?” will help you for this. Note: If you choose a mining pool that requires a wallet address rather than an identifier, simply indicate your wallet address instead of the ID. When you double click on this file. Bat your mining software will therefore run and you begin to undermine: personal PC mining on the crypto-currency XZC with a GTX 1060 3GB with intensity 17. Note: For this tutorial we have chosen to undermine the crypto-currency “Zcoin (XZC)” With the pool “MiningPoolHub”, in your case you will have to choose the crypto-currency that you choose to undermine as well as the most interesting mining pool thanks to our article dedicated to This topic and modify the above information by yours. 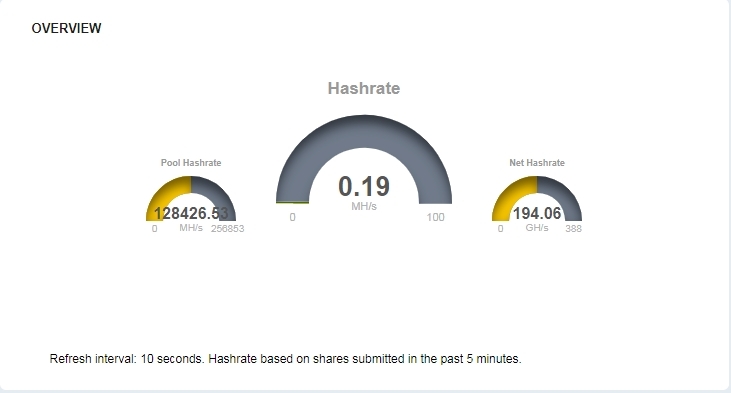 Now that my mining software is running for 10 minutes we will go to the mining pool which is MiningPoolHub for example. In the “My Account” and then “Dashboard” section we can observe that the mining is started. Note: The hashrate may vary on your mining pool, depending on the number of shares you have found and that have been accepted, always rely on what your mining software displays. So you will receive your coins (Zcoin (XZC) For example) according to your mining pool on your local wallet or your wallet on your trading platform at each payout (minimum of corners required) indicated on your pool. For example for the MiningPoolHub mining pool, each payment is made whenever you wish, it is up to you to make the configurations in your account with a minimum of 0.1 coins required. If you have any questions, if you think it is missing something important to add or correct do not hesitate to write a comment. ipsum ut ut diam commodo Aenean porta.